GREENSBORO, NC (Feb. 19, 2018) – As it has for 60 years, the DAYTONA 500 provided another great jump start to what’s sure to be another exciting NASCAR season. And as they have for more than a century, Mack® trucks built in America were on the job. 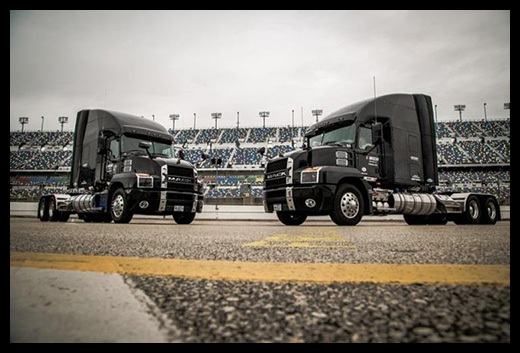 Delivering everything the sport needed to ensure another successful race was the lineup of new Mack Anthem® 70-inch Stand Up sleeper models that Mack Trucks turned over to NASCAR earlier this year. As the “Official Hauler of NASCAR®,” the Mack Anthem models will haul the sport’s equipment and technology – including locker rooms, offices and communications and production equipment – throughout the 36-race, 10-month long 2018 season. “We’re looking forward to another great year with NASCAR, one that’s especially exciting given the debut of our new Mack Anthem model as the sport’s official hauler,” said John Walsh, vice president of Mack marketing. “Like truck drivers everywhere, the men and women from NASCAR who operate these haulers are true unsung heroes. They log a lot of miles over the course of the season, spend a lot of time away from their families, and it’s our privilege to provide them with the state-of-the-art performance, comfort and safety that our Mack Anthem model delivers. We also can’t wait to show off these badass new trucks to NASCAR fans everywhere.” Walsh handed over the keys to the new Mack Anthem models during Fan Appreciation Day at the NASCAR Hall of Fame in Charlotte, North Carolina, Jan. 20. Over the course of the day, fans at the event had the chance to take a ride in the new trucks. Watch the video below to check out the reactions from NASCAR drivers to the new Mack Anthem!